Durable polymer alloys capable of performing better than brass, bronze or babbitt! When it comes to using plastics for various applications, it may become difficult to determine which material to use, especially with bearings and bushings. Below is a quick overview as to which plastic type is best suited for certain environments. PLEASE NOTE: Plastic Clearance/Tolerance is subject to many variables (i.e. 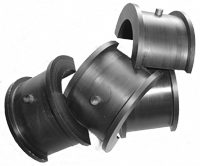 Moisture, Cold Heat) when being machined for specific applications. If lubrication is supplied to a plastic bearing, the load and life are greatly increased dependent on the type and volume of lubricant. Applications where shock, vibration, impact and lower or freezing temperatures are of a concern. Urethane is optimal due to its elasticity in the applications above. Typically used as: Hourglass Bearings, Sprocket Bushings, Kicker Arm Bushings, Pivot Bearings, SN insert Bearings, Rollers, Barker Bearings, and Hanger Bearings. Approximately 4000 PSI is at the top of its limitations. Basically the same as nylon except it absorbs considerably less moisture and is slightly harder. Applications where heat, cold, high pressure, impact and velocity are of concern. Approximately 10 000 PSI is near the top of its limitations. 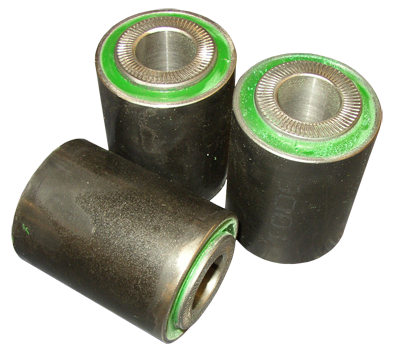 Typically used as: Press Roll Bushings, Mitre Box Bushings, Sheave Bearings,High Load Kiln Bearings (30 000+), Boom Pivot Bearings, Barker Bearings. Generally used in applications where extreme heat (300+), harsh chemicals, moisture and corrosion are of concern. Approximately 500 PSI is at the top of its limitations dependent on additives. Typically used as: Veneer Dryer Bearings, Non-stick Rollers, Food Handling and Chemical Parts. Application of light load, chemicals, cold, some impact. Approximately 500 – 800 PSI is at the top of its limitations dependent on additives. Typically used as: Skate Wheels, Light Duty Bearings, Food and Chemical Parts.